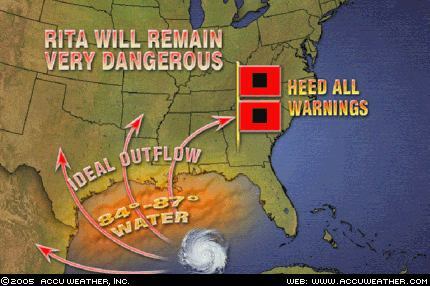 HOUSTON - Hurricane Rita was downgraded to a Category 3 storm on Friday, after winds slowed to about 125 mph. Even so, the storm was roaring toward the Texas and Louisiana coast, creating monumental traffic jams along evacuation routes and raising fears of a catastrophic blow to residents and the nation’s oil-refining industry. 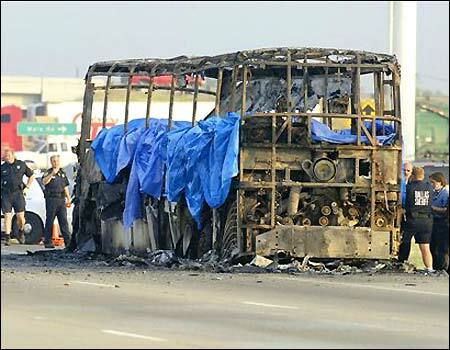 As many as 24 people were killed when a bus carrying elderly evacuees caught fire. Even though the winds had slowed, the storm surge was already taking a toll in areas previously hit by hurricane Katrina. In rainy New Orleans, water poured over a patched levee, gushing into one of the city’s lowest-lying neighborhoods — the hard-hit and largely empty Ninth Ward — and heightening fears that Rita would flood the devastated city all over again. Hurricane Rita roared toward the Texas and Louisiana coast with 135 mph winds today, creating monumental traffic jams along evacuation routes and raising fears of a crippling blow to the nation's oil-refining industry. "We're going to get through this," Texas Gov. Rick Perry said. "Say a prayer for Texas." In rainy New Orleans, Rita sent water gushing over a patched levee, swamping the city's hard-hit but largely empty Ninth Ward just days after the neighborhood was pumped dry. "Our worst fears came true," said Maj. Barry Guidry of the Georgia National Guard. "We have three significant breaches in the levee and the water is rising rapidly." HOUSTON - Hurricane Rita roared toward the Texas and Louisiana coasts early Friday, a major Category 4 storm that spurred a traffic-snarled exodus toward higher ground and fears it could cripple the heart of the nation’s petrochemical industry. Forecasters said it appeared Houston and Galveston could avoid a direct hit as Rita veered slightly to the east, threatening its 140-mph winds at the Beaumont and Port Arthur area about 75 miles east of Houston. It is not often that we as meteorologists throw out terms like catastrophic or life-threatening. However, when dealing with a storm the magnitude of Rita, these terms are certainly appropriate. Rita will still be moving over warm water into Friday. This should allow it to still be a Category 4 storm when it makes landfall late Friday night or early Saturday. One should not focus on this timing though, as strong winds will spread well out ahead of the storm's center. Along the coast of northeastern Texas and southwestern Louisiana, winds are expected to reach tropical storm strength by Friday morning, so Friday will be too late complete any necessary preparations to your home or property. These should be done by the end of Thursday. Please monitor all statements issued by your local emergency management coordinators and heed all warnings and evacuation orders. If you live within a few miles of the coast, this is NOT a storm that you want to stay and try to ride out. IS EXPECTED TO MAKE LANDFALL AS A DANGEROUS HURRICANE OF AT LEAST A CATEGORY THREE INTENSITY. RITA IS MOVING TOWARD THE WEST-NORTHWEST OR 300 DEGREES AT 8 KNOTS. THE FORECAST TRACK HAS NOT CHANGED AND RITA IS EXPECTED TO BE STEERED TOWARD THE WEST-NORTHWEST AND NORTHWEST TOWARD THE UPPER-TEXAS OR THE WESTERN LOUISIANA COASTS AS THE HIGH SHIFTS EASTWARD. AFTER LANDFALL…STEERING CURRENTS ARE EXPECTED TO WEAKEN AND THE CYCLONE COULD MEANDER FOR A COUPLE OF DAYS IN THE VICINITY OF NORTHEASTERN TEXAS…PRODUCING HEAVY RAINS. BASED ON THE FORECAST TRACK AND WIND RADII…THE TROPICAL STORM WARNING HAS BEEN EXTENDED EASTWARD AND NORTHWARD ALONG THE LOUISIANA COAST. ANY TROPICAL STORM FORCE WINDS IN THE NEW ORLEANS AREA ARE EXPECTED TO BE CONFINED TO A FEW SQUALLS ASSOCIATED WITH QUICKLY MOVING RAINBANDS. PORT LAVACA, Texas - Mayor Alan Tharling of Port Lavaca, a city on the Texas coast between Houston and Corpus Christi, is taking creative measures to make citizens take the threat of Hurricane Rita seriously. Tharling says that the 1,000 or so die-hards who refuse to evacuate are being given permanent markers and asked to write their Social Security number, next of kin and a phone number on their arm or across their abdomen — so that returning officials can identify their bodies. GALVESTON, Texas - Hundreds of thousands of people across the Houston metropolitan area struggled to make their way inland in a bumper-to-bumper exodus Thursday as Hurricane Rita closed in on the nation's fourth-largest city with winds howling at 150 mph. 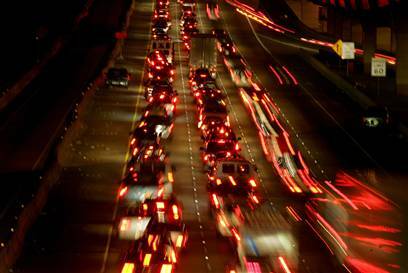 Drivers ran out of gas in 14-hour traffic jams or looked in vain for a place to stay as hotels hundreds of miles away from the coast filled up.